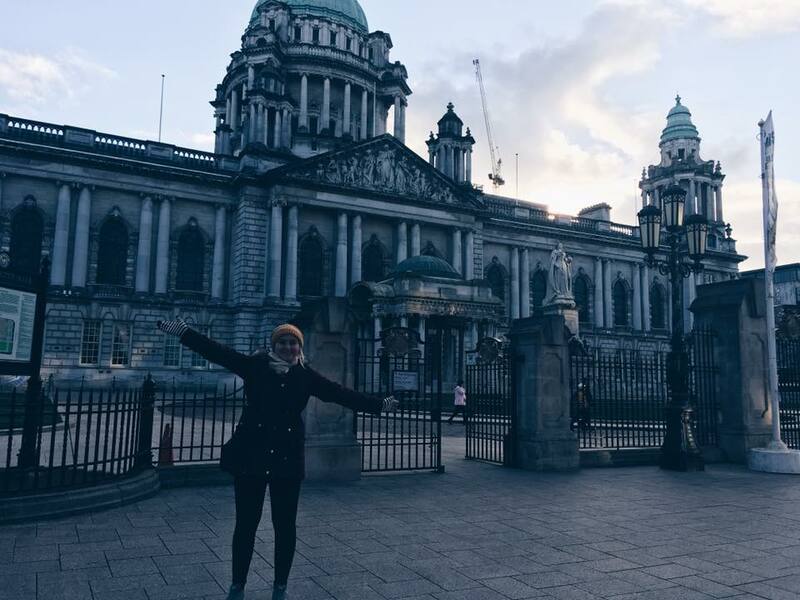 Here’s a ‘wee’ snapshot of my first week in Belfast, Northern Ireland studying at Queen’s University! After a whirlwind first week of jet lag, pub crawls, curry and lots of craic – I have time to reflect on the first leg of my journey. A small gaggle of tired but excited college students formed around the baggage claim and we soon all figured out we’d be studying together at Queen’s. We toddled with our gear to the arrival gate of the small airport. We were warmly greeted by an energetic and organized team of Queen’s international support staff who ushered us to a bright pink Belfast city bus. Belfast’s reputation of generous hospitality became evident as soon as the bus driver found out that we were international students and guests of Belfast. He decided to turn our quick drop off into a mini bus tour. He pointed out all the best pubs, markets and historical sights before dropping us off at our check-in point. I had flashbacks of being a Freshman again at UMass Lowell checking into Fox Hall – meeting all new faces, trying to remember where everything is and being hyper aware of how small the key to my room is. I checked in and received the key to my room – again Belfast hospitality reigns supreme as I was offered tea and biscuits as I waited for my shuttle to take me and my luggage to my new home. I was doubtful if I needed to buy a bed pack from the university but – as my eyes began to grow heavy from 12 hours of traveling, I decided the latter and purchased a £35 bed pack which consisted of a duvet, duvet cover, pillow and bottom sheet. Queen’s is a sprawling campus that envelops a majority of the city. The dorms range from the city centre to tucked away in residential areas. I was assigned in a majority international dorm called “Grant House”. I was surprised to not have a roommate and that it is uncommon for students in Europe to share a room. 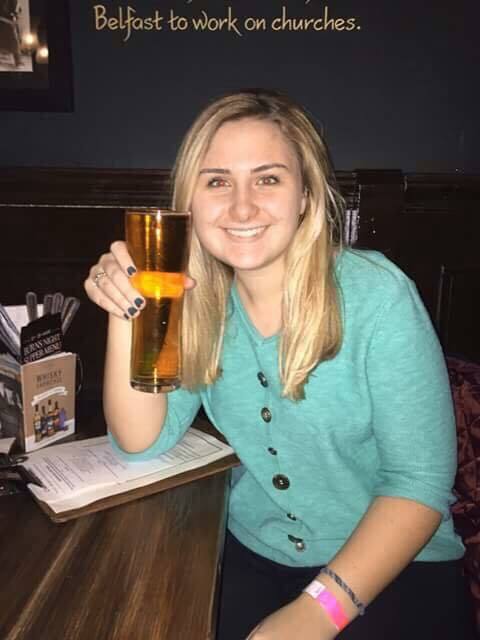 At first, I was lonely as I’ve grown accustomed to coming home to friendly faces and talking about my day with my roommates. Grant House was very quite, as I was one of the first students to arrive. I had unpacked all my belongings, hung up photos of my family and explored the rest of the dorm. I had an onslaught of paperwork and event leaflets and in my true extrovert fashion found that there was a dinner for international students at 6pm. I decided to close my eyes for a little and then head out for some exploring of the city. Before the international dinner I decided to see some of the sights. 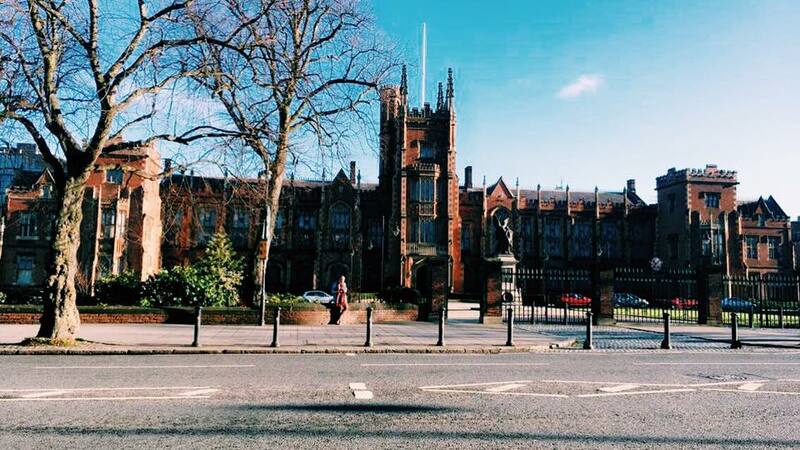 This was my first look at the famous ‘Lanyon’ building which is the heart of Queen’s University. I arrived at the international dinner where I met people from all over Europe and even found a few Americans! I tried curry for the first time which was delicious and tried to remember about 150 names even though I failed miserably even with name tags. After being full of curry and good conversation – a group of us decided to check out the University pub at the student union called the “Speakeasy” that was known for cheap drinks and good ‘craic’. Before we knew it, it was already 2am and it was time to head home before a long day of orientation the next day. The next two days of orientation were tiring but informative and definitely gave me flashbacks of being a Freshman again – going over everything from fire safety to how to access your student email. Although, I was throughly exhausted by the end of everyday, in true Meaghan fashion – I made time for shopping. I stocked up on the essentials like soap, an umbrella, pens and other forgotten items at ‘Pound World’ which is comparable to the Dollar Tree. I love the Belfast style which is trendy, practical but fashion forward. I immediately fell into the trend of 1990’s inspired grunge look of doc martens, chunky boots, rolled jeans and casual layering of light sweaters. 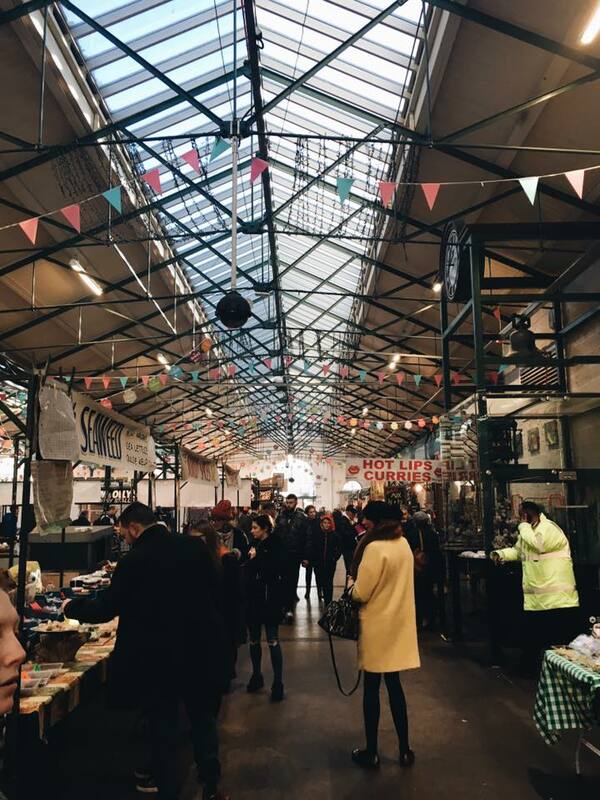 I made an effort to see the famous ‘Saint Georges Market’ which has a melange of fresh produce, authentic street food, live music and artisanal crafts and goods. 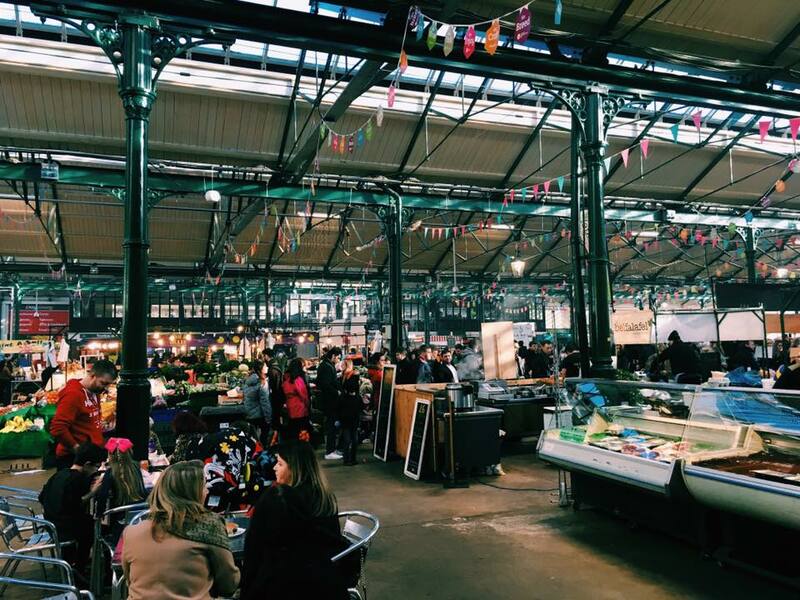 Saint Georges Market has been voted the best market in the U.K and one of the longest running markets in Western Europe. After a couple days of shopping, sightseeing and socializing – reality hit of actual course work while I’m in Northern Ireland. Courses at Queen’s are very interesting but personally challenging as they sway away from cumulative grading and focus on one score based on a singular encapsulating essay at the end of the term. To offset the intensive material they have compulsory meetings called ‘tutorials’ were you meet with a Ph.D. student and have smaller more focused group discussions on the course topics. I am excited but nervous at the quality of my work compared to a regular Queen’s student but looking forward to the challenge! Until next time fellow travelers!